“So, when you want to order, just write what you want on these cards – this one for drinks and this one for food, and clip them on here, OK?”, said the waiter, pointing upwards to a huge wooden clothes peg dangling from a wire above the table. It’s a big peg, a very big peg, and a very big gimmick. We rooted through bags and coats for a pen because there was nothing to write with on the table, despite the whole card/peg/order gimmick, and filled everything in. I had to clip the card into place because Jenny was too short to reach the dangling peg. The waiter came over and plucked our order down and stood next to the table for ages, transcribing everything off the card into a tablet, and then he read it all back to us, by which time we were both thinking that it might just be more efficient to maybe come over and say something like “can I take your order, please?”, at which point we’d just tell him what we wanted, and he could punch it into the iPad there and then. Everybody gets that system, right? But there’s a reason for all this. Chinese restaurants are very formulaic. Fish tank? Gold everywhere? Brusque service? Menu longer than the average novel? Truck-loads of MSG on everything? None of that at Mans Market. The entrance, tucked away in a little corner in the new square opposite Leeds’ latest glass faced building, is the sort of place you’d look at and think “yep, there’s a Big 4 accountancy firm in there”, and indeed there is. Opening the nearly hidden door reveals a stairway decorated floor to ceiling with all kinds of kitsch/gaudy Chinese signs and waving cat statues. It channels the spirit of Hong Kong. There’s a bar at the bottom of the stairs, and then around the corner, hidden from view as you descend the stairs, is the restaurant, all white tiles, wood and industrial lighting, with none of the over-the-top theme of the stairway. It’s a surprising juxtaposition, and gives a big hint that this place is doing things differently. There’s a mercifully short menu – around forty or so dishes in total, mainly classic Chinese food generously re-interpreted. We worked out the ordering system, and did the whole peg thing, and watched the workings of the open plan kitchen, and really, is there anything more hypnotic than watching a group of chefs working together in a kitchen. It’s like a type of ballet, but with woks. We got a couple of drinks, and the waiter asked if we were enjoying them. My glass of water was very good, thanks, designated driver, etc, etc. First up for food was a massive prawn cracker. Must’ve been a foot long. A good prawn cracker. Our waiter asked us again if everything was OK, and we said that we liked the big prawn cracker. It was very good. Next, some dim sum and salt and pepper squid – both excellent, spiky flavours clinging to crisp squid, reassuringly heavy dim sum packed with prawns. Again, the waiter, and then a different waiter … yes, lovely food, really good. Now for some twists. Sweet and sour chicken normally arrives swimming around in a vat of melted sugar masquerading as a sauce, but here it’s presented deconstructed into its constituent parts, chunks of deep-fried chicken skewered and hung from a frame type contraption that means it’s possible to just slide the chicken off the skewer straight down onto the plate, with a small jug of sweet and sour sauce on the side, light and sharp rather than thick and cloying. 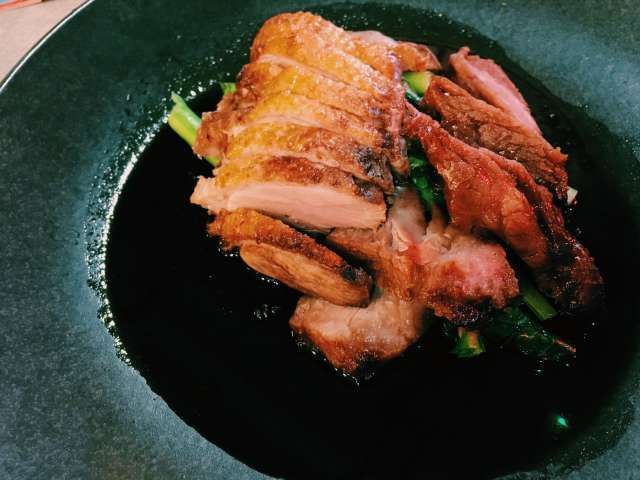 A dish of roast duck and char sui pork is presented in a similarly simple way, a duck breast and chunk of pork sliced and laid atop a bed of greens, a rich sauce poured sparingly around. Good, tasty food cooked in a modern and compelling way. Mans Market has only been open a short while, and it’s obvious that it’s still finding it’s feet a little, hence the overzealous checking up (the food is really, really good … could I just eat it now? Cheers), but that’ll work its way out once the slightly stressed looking bloke in charge of the dining room gets his serving team sorted out properly. Honestly, I don’t envy that job … weekend evenings early on in a restaurant’s life must feel like stepping into Hell, when everything looks OK, and everything should work, but you’ve never actually run the place at full tilt. Mans Market is clearly trying to reinvent the Chinese restaurant experience, and they do a fine job of it. The place feels modern and contemporary, and the food is wonderful, crisp and clean flavours that leave the clagginess and MSG aftershocks of the average Chinese meal far behind. Very good value, very charming service, and a very big change from the average Chinese restaurant. At last, Leeds has a decent Chinese restaurant. At last.